On average, it takes just five seconds to send a text message. You might think that seems harmless enough, but if you’re traveling at 55 mph, five seconds is enough time to cover the length of a football field. As a driver, taking your eyes off the road for that amount of time can be life-threatening. Texting and driving, a form of distracted driving, continues to be a cause of accidents in Pennsylvania and across the U.S. 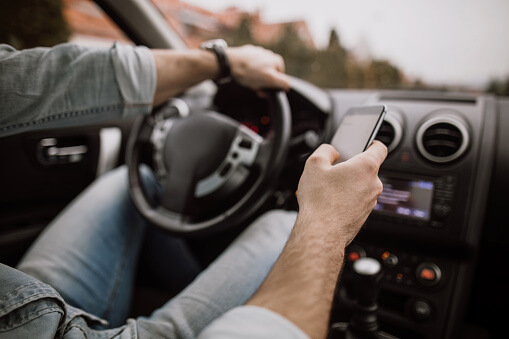 In Pennsylvania alone, more than 15,600 crashes were caused by distracted driving in 2017, the year with the most recent data available from the Pennsylvania Department of Transportation (PennDOT). While alcohol use and speed-related factors tend to be the primary reasons for fatal crashes in Pennsylvania, it’s still alarming to see 58 fatal crashes were directly attributed to distracted driving. What sets texting and driving apart from speeding on Pennsylvania’s roads — is enforcement. It’s much easier for state police to enforce speeding thanks to technology such as laser or radar guns. It’s not as easy to see — and prove — a motorist is texting and driving. In the past few years, Pennsylvania has tried to prevent texting and driving by making it a primary offense, meaning an officer has reason to pull a motorist over for texting and driving alone. The penalty, however, is only a $50 fine, plus court fees. For a non-commercial driver, there are no points and no violations noted on the driver’s record. For a commercial driver, there is only a non-sanction violation recorded. If you’re in a collision with a motorist who was thought to be texting and driving at the time of the crash, it might be difficult to prove the cause was distracted driving. Only if your claim is proceeding to a lawsuit, may your lawyer be able to obtain phone records by a subpoena. Even then, every phone company is different, and some companies may be able to provide more information than others, such as a time stamp and/or the message itself. If a time stamp is available, you and your lawyer may even need to prove the time stamp is accurate. Another issue that should be considered with this type of case involves “punitive damages.” This category of damages seeks to punish the at-fault drive for bad conduct. The bad conduct that would attempt to be punished in these cases is distracted driving due to texting. A personal injury lawyer can help you to navigate accidents caused by texting and driving. If you’ve been injured in an accident and need legal help, contact Stock and Leader’s Personal Injury team today.